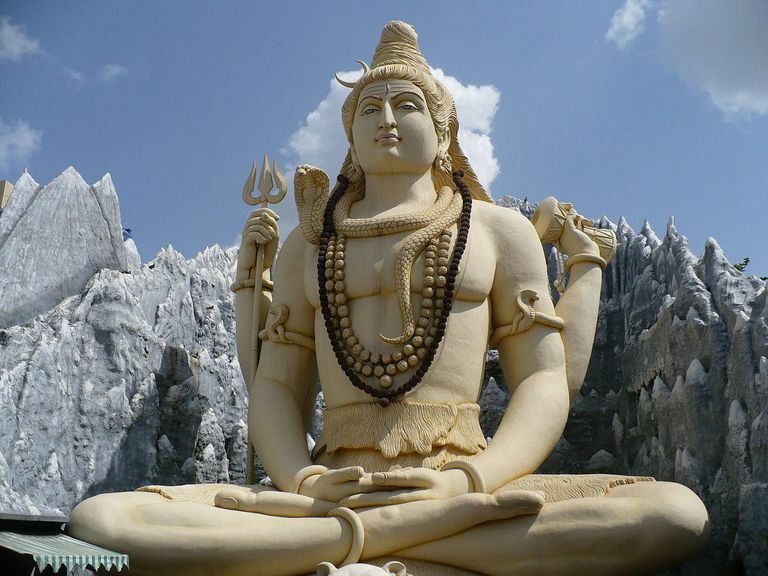 Maha Shivratri, is a Hindu festival that is celebrated each year in honor of the god Shiva. Shivratri is celebrated on the 13th night / 14th day of every luni-solar month in the Hindu calendar, but once a year in late winter is Maha Shivrati, the Great Night of Shiva. The Maha Shivrati is celebrated in advance of the arrival of spring, on the 14th night of the new moon during the dark half of the month of Phalguna (February / March) when Hindus offer special prayers to the lord of destruction. The major festival marks overcoming darkness and ignorance in life, and as such, it is observed by remembering Shiva, changing prayers and practicing yoga, fasting and contemplating ethics and virtues of honesty, restraint, and forgiveness. Three main events in Shiva's life are celebrated on this day. 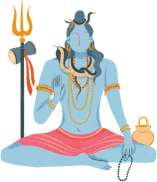 Shivratri is the day in the Hindu calendar when the absolute formless God Sadashiv appeared in the form of "Lingodbhav Moorti" exactly at midnight. God in his manifestation as Vishnu made his appearance as Krishna at Gokul at midnight, 180 days after Shivratri, commonly known as Janmashtami. Thus, the circle of one year is divided into two by these two auspicious days of the Hindu Calendar. Shivratri is also the ritual wedding anniversary of when Lord Shiva was married to Devi Parvati. Remember Shiva minus Parvati is pure 'Nirgun Brahman'. With his illusive power, (Maya, Parvati) He becomes the "Sagun Brahman" for the purpose of the pious devotion of his devotees. Shivratri is also a day of thanksgiving to the Lord for protecting us from annihilation. On this day, it is believed that Lord Shiva became 'Neelkantham' or the blue-throated one, by swallowing the deadly poison that arose during the churning of "Kshir Sagar" or the milky ocean. The poison was so deadly that even a drop in His stomach, which represents the universe, would have annihilated the entire world. Hence, He held it in His neck, which turned blue due to the effect of poison. Those are the most important reasons why all Shiva devotees keep vigil during the night of Shivratri and do "Shivlingam abhishekham" (coronation of the phallic idol) at midnight. The 14th shloka of Shivmahimna Stotra says: "O three eyed Lord, when the poison came up through the churning of the ocean by the gods and demons, they were all aghast with fear as if the untimely end of all creation was imminent. In your kindness, you drank all the poison that still makes your throat blue. O Lord, even this blue mark does but increase your glory. What is apparently a blemish becomes an ornament in one intent on ridding the world of fear." Anonymous. "Why Do We Celebrate Maha Shivaratri: Shiva’s Wedding, Emergence of Shivalinga and Other Mythical Stories." Hindustan Times February 24, 2017. Online, accessed 29 December 2017. Anonymous. "Shivaratri, Maha: A Festival of Contemplation." Revolvy. Online, accessed 29 December 2017. Narayanan, Gomathi. "Shiva Nataraja as a Symbol of Paradox." Journal of South Asian Literature 21.2 (1986): 208-16. Print.